This blower applies to 0.5-35t/h industrial boilers equipped with economizer (pre-heating device) and dust removal devices. All industrial boilers with similar inlet conditions and right performance can use such blowers. But the air inlet temperature may not exceed 250℃. 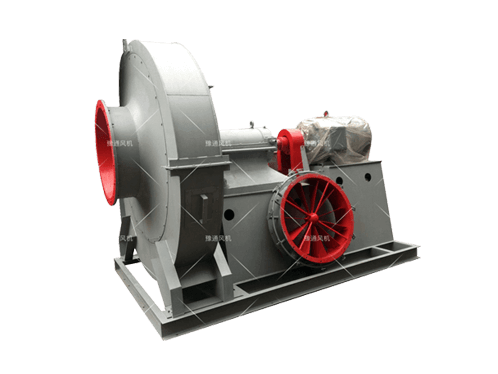 Dust removal device with de-dusting efficiency of not lower than 85% shall be installed before induced draft fans to minimize the dust content entering blowers. This not only reduces environmental pollution, but also lower blower wearing caused by dust, improving blowers’ service life. 1. Impellers- They are composed of long and short front-curved Q345 (16Mn) blades. 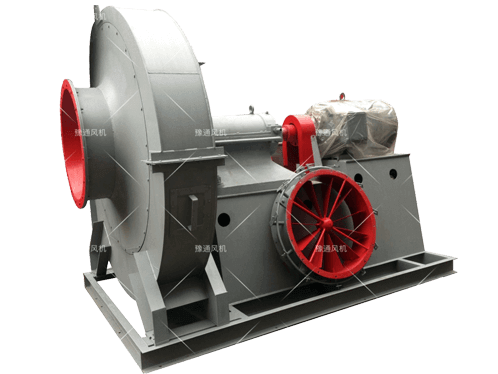 After static and dynamic balance correction, this blower enjoys stable operation. 2. Casing-It is a volute casing made of welded steel plates. It has a dust cleaning door, which is easy for workers to remove the dust fallen on impellers and inside blower casing and thus ensures impellers’ balance and aerodynamic performance. 3. Air inlet- With convergent and streamlined integrated design, the air inlet is fixed to front cover plate with screws. 4. Air damper-The air damper has petal-design blades and are axially mounted before the air inlet. Fans with No. 4-6.3 have 9 blades for air dampers while fans with No. 8 and upper series have 11 blades for air dampers. Thanks to the outside driving structure, they enjoy flexible and easy rotation. The adjusting range is from 0° (fully open) to 90° (fully closed). Looking from the side of the air inlet, the handle of the air damper is on the right side. For right rotation blowers, the handle moves from fully closed to fully open by moving from bottom to top. For left rotation blowers, the handle moves from fully closed to fully open by moving from top to bottom. Air damper has to be lubricated carefully to ensure its normal operation. Blowers apply temperature-resistant (260℃) lubrication grease for lubrication, ensuring good lubrication under high temperature operation. 5. Driving system-The driving system consists of main shaft, water cooling bearing box and coupling, etc. The main shaft is made of quality steel and the bearing is rolling bearing. The bearing box has both integrated type and separate type. Blowers with No.4～No.6.3 apply integrated type bearing box while blowers with No.4～No.6.3 apply water cooling integrated bearing box. Both bearing boxes need cooling water; water consumption varies with ambient temperature and is usually considered as 0.5-1m3/h. Equipped with thermometer and oil level indicator, the bearing box uses L-AN46 (Lubricating Oils for Total Loss Systems L-AN). The oil amount to be added shall be based on the oil level indicator.